It’s always an occasion when we prepare pancakes for breakfast at our Swellendam guesthouse. Did I say pancakes? I meant flapjacks. Or is it drop scones? Whatever you call them, they are amazing and the recipe we use is a special one. 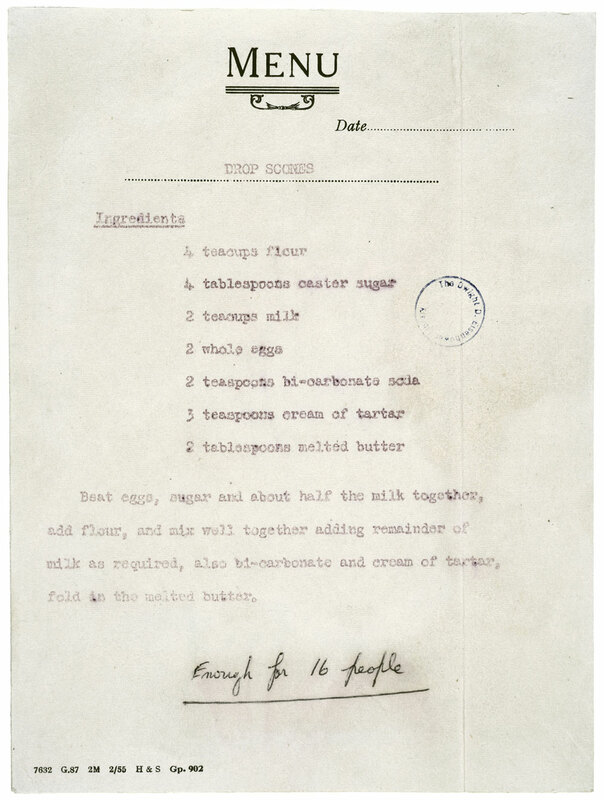 In honor of our festive pancake day, we present to you a recipe for drop scones, otherwise known as “Scotch pancakes”, that Queen Elizabeth made for President Dwight Eisenhower on the occasion of his visit to Balmoral castle in 1959. 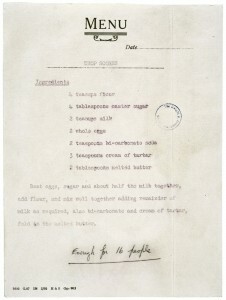 According to the US National Archives, the Queen prepared drop scones for Eisenhower, using a family recipe. Later she sent Eisenhower a letter and enclosed the recipe, with annotations and a suggestion to use treacle in place of the caster sugar. Download the recipe above and taste Aunty Betty’s best. Here in the South Africa we make crepes and call them pancakes, we make griddle cakes and call them flapjacks and we think of drop scones like drop biscuits, instead of cutting out triangular shape scones for baking, we drop the dough from a spoon onto the baking pan. But “drop scones” in parts of the UK, in particular Scotland, where Balmoral castle is situated, are more like American pancakes than typical scones. Drop scones are thicker than American pancakes, and a little smaller. If you read the Queen’s recipe in the image above, note the use of “teacups” as measurements for flour and milk. Before Fanny Farmer we used teacups for measures as well. To figure out how much a typical teacup holds, we tested two teacups, an English made one, and a French limoge. Oddly, when I filled each (completely different shape) tea cup with flour and weighed them, the result for each was exactly 100 grams. By volume, the teacups were each 3/4 of an American standard cup. So “4 teacups” would be 3 American cups, and “2 teacups” would be 1 1/2 cups. I don’t know if the Queen used salted butter or not. Her recipe doesn’t call for it, & since I use salted butter, I did not add salt to the batter. A note on the cream of tartar. We happen to have some in our pantry, but many people don’t. Cream of tartar is a dry acid. It combines with the alkaline baking soda to create the leavening in the scones. Baking powder is just the combination of baking soda and cream of tartar with some corn starch thrown in, so if you don’t have cream of tartar, you can substitute both the baking soda and the cream of tartar with baking powder. If you happen to be in the US over the next six months, here is an amazing exhibit to add to the itinerary. An exhibition at the National Archives in Washington, DC. In the Lawrence F. O’Brien Gallery June 10, 2011 – January 3, 2012. What’s Cooking, Uncle Sam? The Government’s Effect on the American Diet is an exhibition of records from the holdings of the National Archives that trace the ways that food has occupied the hearts and minds of Americans and their government. From Revolutionary War rations to Cold War cultural exchanges, these documents and images reflect many of our current concerns about food safety and nutrition.